Pro Care provides hospitals, nursing homes, and hospice centers with professional, compassionate, and punctual pre-facility and inter-facility medical transports and care. Our management team has developed comprehensive medical transportation solutions to meet the needs of both large and small institutions. 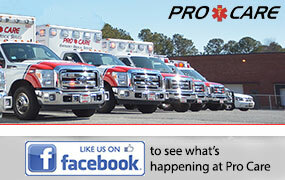 Pro Care has entered into contracts with 18 medical facilities and is currently the exclusive provider of emergency medical services to Gwinnett Medical Center. We also provide services on a non-contractual basis to over 50 additional medical facilities as well as to various air ambulance services. We have built our business around understanding and responding to the needs of our customers. We welcome the opportunity to explore how our team of over 100 EMTs and paramedics may be able to meet the needs of your facility and, more importantly, your patients. Please visit the Hospitals page, the Nursing Home page, and the Hospice page to learn more about the services Pro Care provides to these different types of medical institutions.